When you purchase a house, property tax can be confusing and frustrating, especially if you don’t understand why you appear to be paying property tax over and over again. You will likely pay property tax at close of escrow, and then again through something called “Notice of Supplemental Tax”, and then again when taxes are actually due for everyone: November 10th (late after December 10th) and February 10th (later after April 10th). When you purchase a house, you essentially pay property tax three times within a very short time period. At close of escrow, you will likely pay money to the seller to reimburse them for the prorated portion of the property tax bill they already paid for the current year. Soon after you close escrow, you will receive a Notice of Supplemental Tax Bill in the mail. The increase (or decrease) in assessed value resulting from the reappraisal is reflected in a prorated assessment (a supplemental bill) that covers the period from the first day of the month following the supplemental event to the end of the fiscal year. A fiscal year runs from July 1 through June 30. In essence, the Notice of Supplemental Tax Bill makes up the difference between the amount the seller paid (which is likely less than what you will pay) and the amount you will pay for future tax years (likely more than what the seller paid). Sometime during the year (depending on what month you purchase the house) you will receive your regular, annual property tax bill which will include the “ad valorem” tax amount (the amount based on the value of the property) in addition to any direct special taxes. Lastly, we want to emphasize that property tax is due whether or not you are in possession of a physical tax bill! It is your responsibility to pay your tax bill. Yes, the County Assessor’s Office will eventually send you a tax bill, but they are government, and, as good as they are at keeping everything straight, they can sometimes be a bit slow in delivering your new tax bill to you. This timing can also depend on what month you close on your house. If you close immediately after they just sent the new tax bill to the OLD owners, you may not receive a bill until a year later. So you need to be proactive and look up your tax bill and make sure it is paid. Again, taxes are due: November 10th (late after December 10th) and February 10th (later after April 10th) every year! To look up your tax bill, you can go to the Santa Clara County’s website and look up your property’s assessed taxes by parcel number or street address. 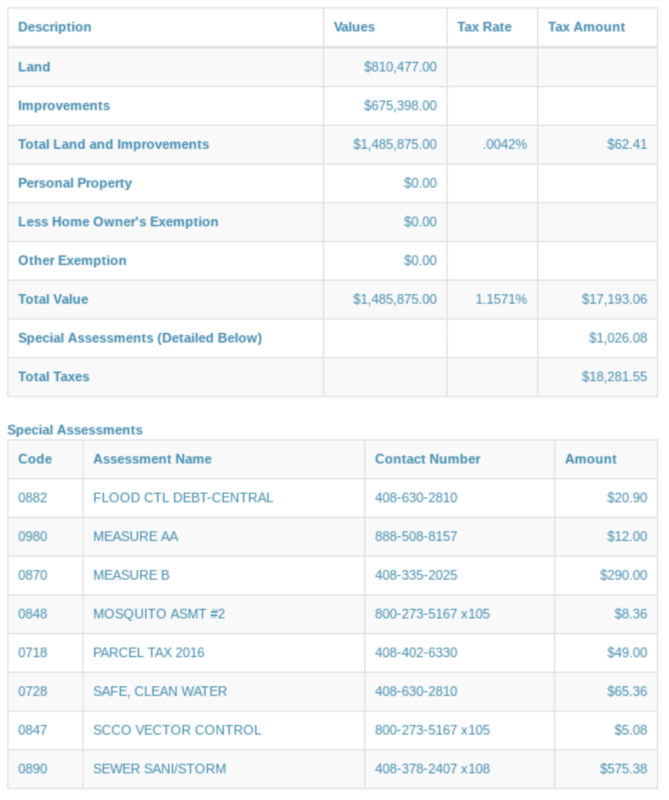 You can also see what taxes are owed and view, download and/or print a copy of your current tax bill in PDF format on this site. This page is very useful and is the resource for knowing about your property tax – how much you owe and and when it needs to be paid. As always, you can call Brian or Dan anytime to ask questions if you don’t understand your bill or feel that something is amiss.